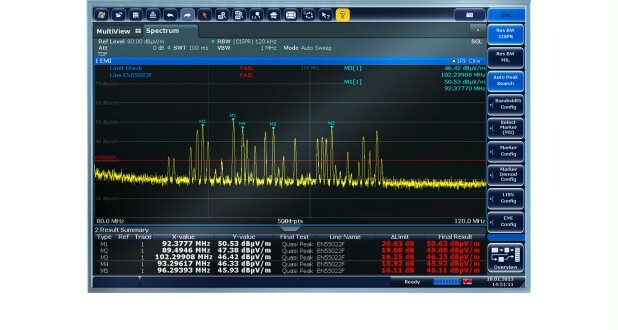 The R&S®FSW-K54 EMI measurement application adds EMI diagnostic functionality to the R&S®FSW signal and spectrum analyzer's range of functions. The R&S®FSW-K54 EMI measurement application adds EMI diagnostic functionality to the R&S®FSW signal and spectrum analyzer's range of functions. For precompliance measurements in preparation for certification, the R&S®FSW-K54 option includes EMI bandwidths for commercial and military applications, detectors such as peak, quasi-peak, CISPR-average and RMS-average, limit lines and correction factors. The spectrum display with logarithmic frequency axis makes it easy to analyze measurement results over a wide frequency range and to display limit lines, test reports and measurement documentation in accordance with standards. Measurement results can be better compared with results from test receivers. The R&S®FSW spectrogram display allows users to analyze the behavior of disturbance signals versus time. Measured spectra are recorded and displayed as vertical lines lined up next to each other. Color coding indicates the amplitude. The spectrum and spectrogram are displayed simultaneously on the screen.